Day 1 ended with Anita Dongre’s showcase titled ‘Songs of Summer’ — a fitting moniker for a collection that captured the essence of summer through subtle pastels, exquisite light fabrics and floral motifs. Classic lehengas and draped saris in cool fabrics such as modal, light-weight handwoven silks and cottons sat pretty on Dongre’s vision of the perfect summer bride and groom. Just when we thought the grandeur of the collection was at its zenith, out walked Shahid Kapoor and Mira Kapoor in what could only be described as ensembles that had been specially tailored to narrate the story of their beautiful journey. It was utterly resplendent, to say the least. Safari dresses, coats, jumpsuits, blazers, skirts, blouses and jackets graced the runway at Rara Avis’s show. Funky prints, hand embroidery, intricate beadwork, textures and cutouts comprised Sonal Verma’s collection that was inspired by traditional African motifs. The collection also included elegant, formal gowns with sensual cutouts, structured quilted vests and embellished corset belts. As a classic touch to the brand’s edgy appeal, Sonal chose to play with bejewelled accessories, like embroidered belts, purses and totes that made for a charming array of styles with each piece being handcrafted to perfection – from finely-cut fringes to eye-catching eyelets, metallic/antique studs and gold accents, the clothes were for bold looks. Colours and prints mixed in vibrant hues and patterns at Label Ritu Kumar’s collection reminded us of the 90’s punk style. New-Age textiles like shimmer jerseys, lurex, georgettes, handlooms and splashes of sequins in black, blue, ecru and pink were spotted. Metallic T-shirts and matching flared minis, micro pleated asymmetric maxis, sari-inspired gowns and micro-mini silver sequinned skirts glittered on the ramp. The printed velvet line comprised capris, blousons and a very stately power-packed pantsuit, while the black net creations with multi-hued motifs cascading down the front were eye-catchers. Added to the collection were some crazy prints for wrap around maxis or bell-sleeved midis. For some more excitement, nothing beat embroidered denim jeans with an abstract, printed, long-sleeved blouse worn with a waist pouch. Naushad Ali infused stripes, checks and polka dotted prints in silk, bamboo cotton, crêpe and linen on the runway. Introducing refreshing new shades of green, mingled with indigo, yellow, black, white, grey and red ensured that the natural-dyed garments stood out. Fuss-free, comfort-driven yet stylish long jackets, wrap around dresses and skirts and linen trousers were some of the key highlights. With a beautifully iridescent Shibori collection called “Ties That Bind”, Richard Pandav and Amit Vijaya’s collection rendered khadi, silk and silk cotton blends in metallic hues. In shades of mustard, brown, black, red, white and blue, geometric prints were turned into relaxed silhouettes such as those of fluid bias cut skirts, metallic dolman sleeve cropped jackets, flowing kimono style robes, cropped Bermudas with simple white shirts, wrap covers and flared midis with capes. Zari perfectly highlighted the clothes meant for evening wear. 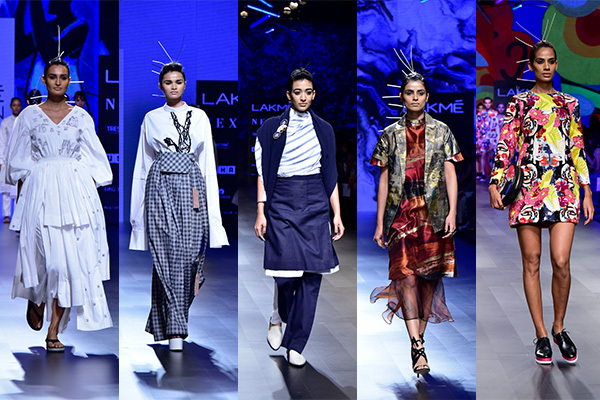 Titled “Prahara”, Urvashi Kaur’s collection came alive in handwoven khadi and Kota Doriya in linear patterns and a palette of grey, ecru, blue and black. Techniques of hand-tucking and micro-pleating block printing, Shibori and Leheriya dyeing added fine details to tailored shirts, skirts, jumpsuits and panelled separates for a cohesive idea. While the womenswear offered a feminine appeal with saris, cropped-tops and jackets, the menswear with floppy sheer coats, draped cowl pants and baggy drop crotch salwars made for easy-dressing. Strengthening the notion that people are beautiful in all shapes and sizes, Rixi and Tinka Bhatia’s half Full | CURVE promoted body positivity inspired by the beauty of nature. The fabrics were a mix of pure georgette, sheer chanderi, Dupion silk and were splashed with delicate bouquets of flowers in thread work, sequins, beadwork and lots of appliqué. Pastel hues ran through the collection and the silhouettes were vintage, wearable and chic. Lungi-style draped skirts were all the rage and were worn with jackets and cowl kurtas teamed with multi-coloured covers. Metallics came to the forefront in the shape of dhotis and palazzos. The details were kept simple and prominent with a profusion of pin tucks and tassels. For Ikai, Ragini Ahuja brought in her trademark relaxed fits in natural textiles and played creatively with distressed denim for pants, dresses and jackets. Sheep Napa leather in intricate appliqué and Shibori techniques gave the oversized silhouettes a sense of comfort. Dresses, kurtas and kaftans were awash in deep navy blue with discreet linear and leaf embroideries in white. Denim bralets were the key trend that made the collection perfect for resort wear. Dhruv Kapoor’s collection brought together a clever mix of African tribal patchwork and Japanese geisha-inspired femininity. From simple stripes to vintage floral prints, clean denim silhouettes to flouncy sheer tulle overlays and minimal embellishments to metallic textures; the garments had individual yet cohesive identities. Oversized lapels, smocked sleeves and lurex accents made trend statements. Accessories such as an extra-long belt with metal grommets with leather clutches hanging from them and waxed napa leather sandals saw the best reinvention of both cultures. Inspired by Mumbai’s iconic Dhobhi Ghat, Mohammad Mazhar‘s collection was an all-white affair of day dresses, tops, kurtas in fabrics of mulmul cotton, cambric and lawn, scattered with handcrafted Bhalwa prints and mocha embroidery. Keeping the collection, ambiguous, and “agender”, Two Point Two‘s collection involved anti-fit yet structured silhouettes in fabrics of cotton, silk organza and poplin in a simple colour palette comprising whites, greys and blacks. The highlight was the sustainable abstract threadwork done from fabric waste. Creating interesting drapes of yak and pashmina wool knitwear using simple techniques of tucks and pleats, Padma Raj Keshri‘s collection was a modern and organic take on the ideals of travel. Intricate and distinctive hand-painted textiles in earthy as well as metallic tones were well-tailored into Scandinavian-inspired silhouettes in Helena Bajaj Larsen‘s collection, lending it an effortlessly elegant style. Devoted to his maximalist aesthetic of bold, colourful and sequinned graphics, Ayushman Mitra‘s collection for Bobo Calcutta was steeped in his artsy aesthetic of embracing queer expressions of love.